This should work on all browser-types. Thanks so much for putting this up on your site. I changed the post, inserted your link, and took out my whole apology about the browser problem with Flickr. You’re a pal. Hey, it works great too! Thanks! Just caught up with your last few posts. CONGRATULATIONS on your piece in the NYT. 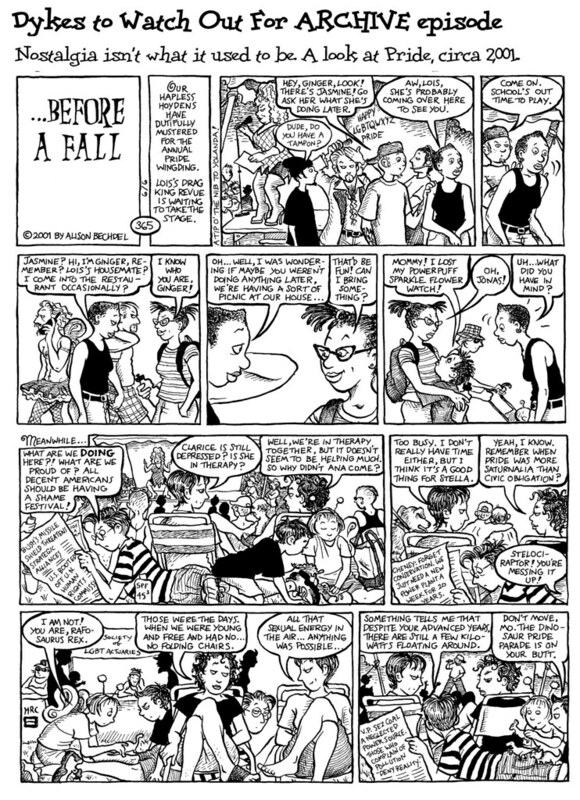 I loved Fun Home, and I agree, it is hyper-literary and worth many rereads through the years to come. Plus gave me new words and new authors to explore. Anyway, now that you are a famous mainstrean author (!) with a NYT review and all, I though I would jump in now, before you start getting 100+ comments a day on your blog, and tell you that I have been reading DTWOF for 10+ years, have all the books and reread them often and just absolutely love your work. I agree w/Emma, the strip is priceless — especially that first frame. takes me back to see Jonas before she became a hormone obsessed teen. don’t worry TOO much about letting a strip go here and there while you tour. share the book and your technique and the intimate details of your life w/devoted fans and those who’ve just discovered your work. you deserve the recognition. will see you in Chicago w/my book in hand . . . I totally agree! That’s is the best line – as a menstruating drag king I can attest to the surrealism of the experience! I can’t believe I spaced on Alison’s visit to Philly! Back when we first saw Jonas! I love flashbacks. That second-last panel is making my eyes misty… wouldn’t trade my family for anything, but oh, yeah, those were great times, when I didn’t have any… folding chairs. Ahh, nostalgia. I was just about to post about the ‘Dude, do you have a tampon?’ line. Brilliant. Yup, I love to see blood on my softpackie, personally!